As you readers may have heard me lament before, chameleons are shy and antisocial. Both of my Jackson chameleons (Darwin moreso than Eldridge) would simply lean away from my hand, avoiding human contact unless actively picked up, at which point they would both sit on my outstretched fingers and pout. Eldridge would get over it and start exploring, but Darwin would just stare at me with a certain death gaze, utterly refusing to have fun. Well, as bad as those two were, neither can even compete with the introversion of the Labord's Chameleon. According to a new paper in PNAS, these little buggers would rather spend most of their lives within the confines of an egg than be forced to explore the outside world. 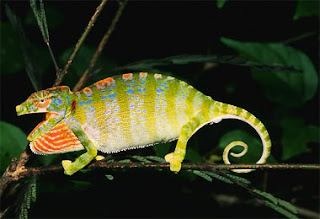 In fact, Labord's Chameleons spend 8 or 9 months in the egg and only 4 or 5 months outside of it. The animals reach sexual maturity within two months, breed, and proceed to die. When the dry season hits, all of the adults are dead, and the population consists only of embryos in eggs. The babies hatch 8 or 9 months later at the start of the rainy season, grow quickly, get lucky, lay their eggs, and drop from their perches. And so the bizarre, morbid cycle continues. Most animals would opt to evolve a mechanism for getting through the dry season while still alive, but it would seem that Furcifer labordi has put all of its eggs in one basket, as it were. Hat-tip to Zooillogix for reporting the story! Allow me to sit here turning green with chameleonenvy. Wow, that was interesting. It held my attention, well done sir!